The King of Infinite Coincidences! Do you remember our first project which was based upon a quotation from Shakespeare? If not, you can read it again here. I swear that I had not seen this book cover when I made my project. How incredibly weird is that? To be so very, very similar .... to have used the same head shape ... pointing in the same direction even ... with practically the same quotation? A few weeks ago, on Radio 4, I heard a mention of phenomena such as this, where two people spontaneously and simultaneously produce similar inventions, works of art, pieces of music etc. I was really interested in the idea at the time ... and now I think I need to investigate it further! Unlike Julie, I’m a very recent convert to the cult of yellow. For a long time, I could be counted among those active-dislikers she mentioned, and it was one of the few colours I avoided at all costs. But then, somehow, over the last six months or so, I’ve had to admit to a sneaking, grudging and now blossoming admiration. I still tend towards the green-ish or mustard ends of the yellow scale, but I’m definitely getting braver. 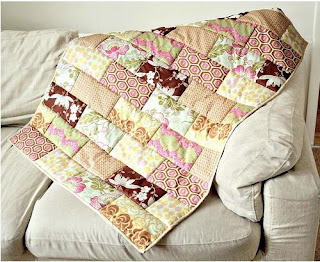 Amy Butler's fabulously retro mid-century modern prints lured me into making this lap-quilt for my yellow-loving Grandma. Then, thanks to a vintage button kit from Kitschy Digitals and a delicious piece of charcoal grey fabric, I took my first for-keeps trip to yellowsville. Ball rolling? I think so. 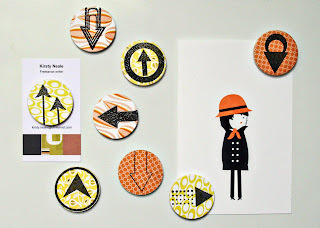 Clash-tastic yellow and orange prints plus Banana Frog stamps combined forces to make a set of mini-magnets. 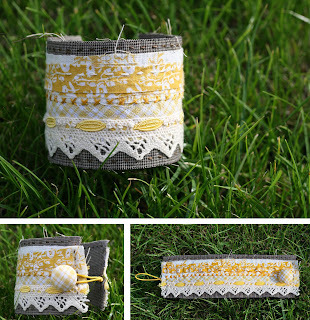 I even sneaked a little bit into my guest-post for Shimelle’s Month of Colour. And then, just like Julie, I was sunk. New home, plus new-found colour obsession has seen the yellow creeping through my front door, too. 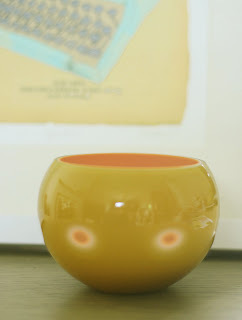 A vintage glass bowl, teamed with just a hint of yellow in my current favourite Etsy print. Small splashes like this are an easy way to start. But it's a slippery slope. 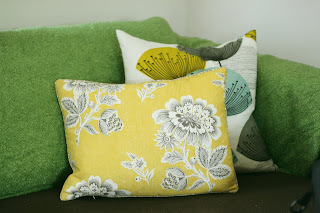 Yellow cushion covers? Check. 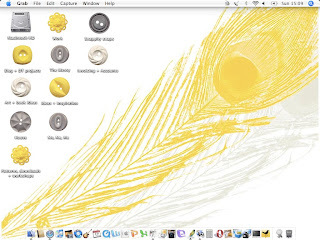 Yellow wallpaper and folder-buttons on my laptop? Oh, yes! 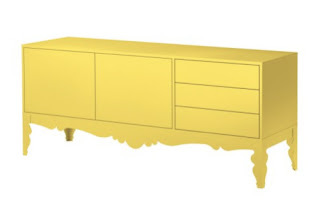 How about two whole acid-yellow chairs? Those are a work in progress, a job for me and Mr Allen-Key over the weekend, but you can see a little splash of the colour here behind a pile of sunny-hued books. So, the big question is, what’s in all this custard-coloured loveliness for you? Apart from (hopefully) a bit of inspo to try some yellow out for yourself, I’ve got two appropriately-coloured giveaways to offer up. That’s on top of the stuff Julie and Amy have already posted, so there’s no reason not to enter again if you’re so inclined. First of all, some cuff-ish goodness. 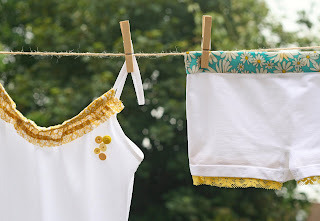 Yummy, raw-edged fabric, lace and embroidery, fastened with a matching button and a tiny scrap of stretchy elastic to make it size-adjustable. Or maybe you’d prefer Little Yellow? Pen and ink drawing, with fabric and embroidery-thread detail, around 14x20cm in size, and ready for you to frame any way you like (the cute Kitschy Digitals frame is just for fancying-it-up-online purposes). All you need to do if you want to win one or the other, is leave a comment below, letting me know which you’d prefer. I’ll pick two winners at random next Wednesday, 1st July. If you want to link me up to any yellow yumminess you’ve spied on your travels, that would be fun, too. Don’t bother mentioning this little bit of amazing, though. Seen it. Love it. Already added it to the list. 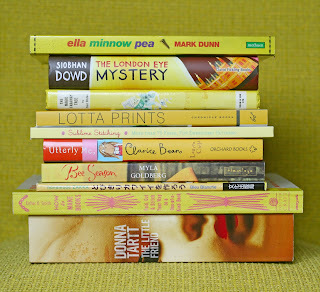 As promised in my last post, we've got another giveaway of glorious yellowishness for you. 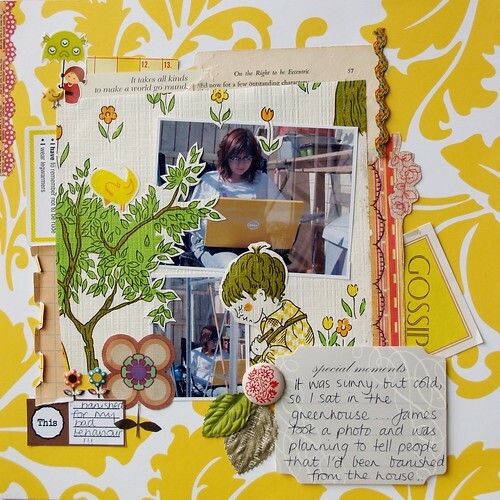 The crazy-wonderful Amy Wing from Gauche Alchemy , whose Acme kits I design with, has gone sunny-side up too and is giving away one of their colour kits ....one of their yellow colour kits appropriately enough! Just go to Amy's blog post and leave her a suggestion for how they could re-name their 'yellow colour kits'. The more unusual, intriguing and striking the better .... when you read Amy's first ideas on what she could call them ...you'll see there really are no limits to what she'll seriously consider! She'll draw a winner at random for the kit and if she likes the name too - she'll alter it to your suggestion in the Gauche Alchemy ArtFire shop. 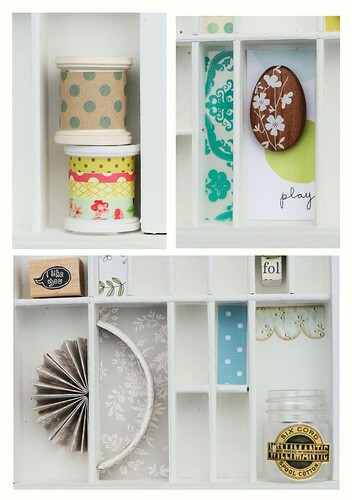 So, off you pop ....get over to Amy's blog post and bag yourself a packet of eclectic, sunshiney bits and bobs. Earlier this month Kirsty and I were both happy to have been invited to flash our colour credentials for Shimelle Laine. Or rather, Shimelle asked us to be guest bloggers during her A Month of Colour project. My contribution, a step-by-step walkthrough of how I created an atypical colour combo, was featured on Tuesday - but you can catch up with it here. Kirsty's project will be up very soon and she'll let you know all about it over here too. Playing this track while reading this is entirely optional ... but it is a very nice one and it makes the perfect backing track for the things I've got to share with you. 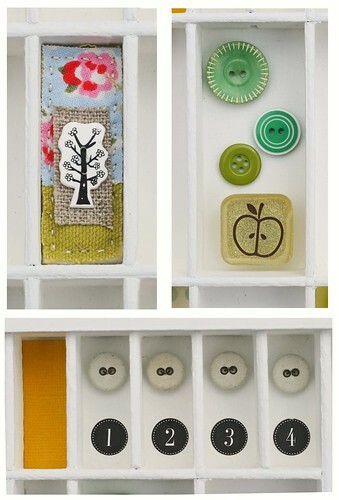 The mini collage [top] was created in response to an art journaling prompt on Emily Falconbridge's blog. The question was 'What gives me hope?' and my immediate thought was 'sunshine' as everything seems possible when the sun shines. Miserable things still happen when it's sunny, but given the choice, I'll take miserable with the sun on my back over crying in the cold and wet any time! 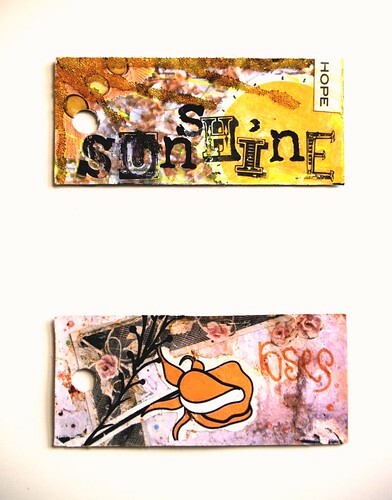 On a similar theme ...I created this predominantly yellow mini-tag book last year and filled it with quotes around the idea of positive thinking: You can read the story behind it and see more images in my blog post here. This little golden-plumed guy is a recent addition to our bird ornament flock, bought for me as a gift from an antiques fair this month. He is unable to stand upright, he's a little grimy in places and has only one claw on his left foot ... but, considering that I often share 2 out of 3 of those traits ... I'm rather smitten by him and all his imperfections! It's the same coat I mentioned in our Coraline projects post last week. It's also the coat which means I'll never again be lost in a crowd. 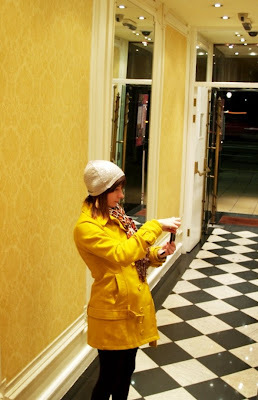 The coat which has elicited responses such as 'Oh.... that's ....yellow'. The coat which I employ as a beacon when arranging to meet up with new people at work ...'I'll be the one in the yellow coat' has never failed to point someone toward me yet! It's the coat which I wish my Grandma could've seen me in. As a fellow colour-lover - she'd have wholeheartedly approved of it. Put simply it cheers up drab, grey winter days and I need all the help with that I can get! So, are you a convert to the bright-side yet? 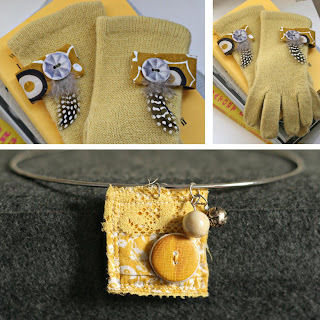 Any plans for a creative splurge with yellow as your focus? Are you running out in the next 5 minutes to buy a fabric dye to wave a golden wand over less sunny items in your wardrobe? How would you like one of these to help you out with that? 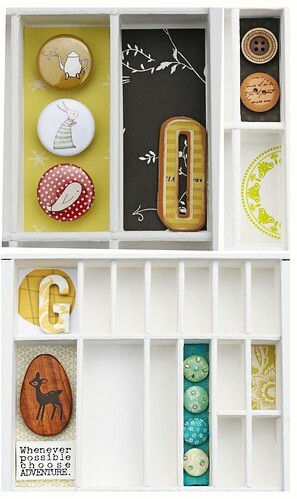 ... so, I've also made three little [3"x4"] tag books to give away. Each has a Love Elsie fabric cover and contains an assortment of yellow and pink papers and I'll also throw in some smaller punched ftags for you to decorate the books with. 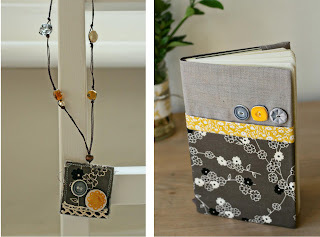 All you have to do is leave me a comment stating whether you'd like a fabric brooch or a tag book [or both!]. You have until the end of the month to enter and then I'll pick winners at random, pack them up, trundle up to my local Post Office [which is next door to the bakery which sells the best Vanilla Slices ... and I might also pop in and buy one ...so you'd be doing me a favour really] and I'll send yellow themed freebies direct to your doorstep! 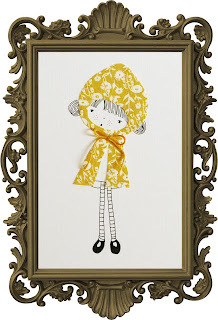 *Copy*: This week we've been copying Coraline. 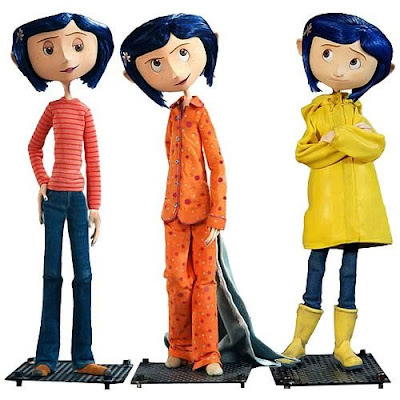 Lovely, animated, miniature, feisty Coraline. To say that this incredible stop-motion animated film is jam packed to its tiny rafters with inspiration would be something of an understatement. Every inch of it contains something fascinating. I had the pleasure of seeing it in 3D and was utterly amazed and delighted by it. If you've seen it too.... what did you think of it? Did you love her tiny gloves? How much did you wish she could fall asleep and wake up back in her real bed? Did you stay until the very, very end where there was a strange 3D mouse mobile type thing? Do you find yourself wondering if blue hair would suit your complexion too? Good no? There's also an official Coraline website which is just brimming with hidden wonders that, to do them all justice you should grab yourself a beverage of your choice and spend a good while mooching around Coraline's world. You can stroll into 'The Other Mother's Workshop' where you can give yourself button eyes, you can have your tea leaves read and you can [and must] watch some of the incredible 'behind the scenes' extras. You can also see some of these extras via this YouTube page and if you watch nothing else - take 2:05 minutes out of your life to ponder the intracacies of knitting a jumper for a 22cm tall model!! It's all quite mind blowing. I already had the yellow coat and now I'm just one Google search for 'blue wigs' away from the full look! The brooches are a mixture of fabric off-cuts, tulle, ribbon, trimmings and .... buttons... of course! Although none of the aforementioned buttons ended up being sewn into my eyes [the threat Coraline is trying to escape in the movie] ... I did come close to having them permanently attached to my ears. Well, when I say I did all that, what I meant to say was I gave my other half instructions to do all of that ....then waited for the glue to dry. After several hours I asumed they must be ready - and tried them in my ears. He looked up at me in surprise as I admired them in the mirror and asked "Are those dry already?". They weren't. Luckily, although my lobes were a bit sticky I could still remove the button earrings. It could've been so much worse! Like Julie, I was utterly smitten with Coraline's world. I'd been impatiently waiting to see the film ever since spotting some of the fifty boxes sent out to various bloggers by the film's press office (you can find links to most of them here). As someone who's been on the receiving end of more PR packages than you can shake a trashy plastic stick at, these were head, shoulders and, in one case, miniature hands above the average swag. The very notion of individual, handcrafted boxes, filled with strange and wonderful pieces from the film had me completely charmed, and - let's be honest here - just a tiny bit envious. Inspired by the boxes and, in turn, reminded of Joseph Cornell's assemblage boxes (well worth Googling him if you've never seen them), I set out to create something which also had the film's strapline at its heart: "you are about to enter a world where everything you'll see has been created by hand". 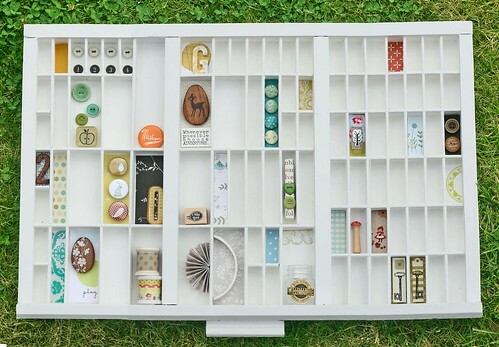 My starting point was a vintage printer's wooden type tray picked up on eBay. After copious coats of white paint, the individual segments were all ready to be filled with items made either partly or wholly by hand - some by me and some by other people (the set of little badges, for instance, are from Emily Martin's ever-lovely Etsy store). In case you think I'm suffering from some form of selective poor sight, I should probably point out that it's a work in progress, and one I'm quite happy not to have finished yet. The remainder of the tiny handmade pieces are things I'm looking forward to creating and collecting over the next few months, and to sharing here along the way. Guest Copy + Paster = Sian Fair likes: travelling hopefully; IKEA and rereading "Confederacy Of Dunces". Sian doesn't like: queue jumpers; hot milk and days when the post van doesn't arrive. 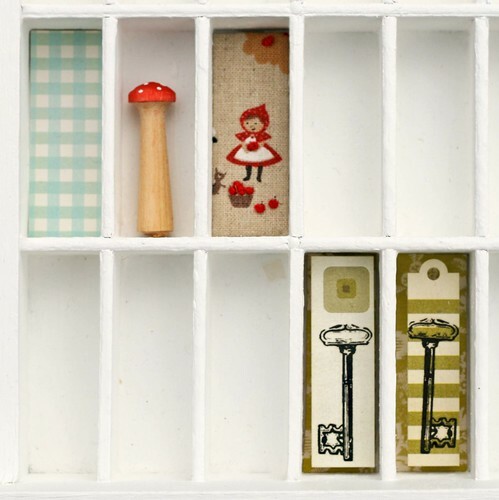 Sian has contributed some amazing work to the Copy + Paste Project Flickr group so we're delighted that she accepted our offer to create something Coraline-esque. Sian is in the middle of a doll dress-making rennaisance, taking up the craft again after whiling away many hours creating couture for her Sindy dolls when she was younger. Her miniature dress-making skills can also be seen on this 'Alice' themed scrapbook page she created in response to our previous challenge. Sian says: "I started off with the idea of the black buttons and decided to do a button bouquet to which I added a few little black dogs and a couple of windmills. The Coraline rag doll took on a life of her own; she looks spookier than I first intended! She's made from a pair of old ballet tights." We're also happy to have given Sian a good reason to go haberdashery shopping aftershe used up all her black buttons! I'm not sure I'll ever be able to look at black buttons again without thinking of Coraline and the 'Other Mother' .... isn't it interesting how things can so quickly become iconic? train a troupe of circus mice ...... whatever you feel like doing is more than OK with us! As always, you can post links to anything you create in the comments below and / or drop them in our Flickr group and if you do nothing else .... go and see tiny Coraline on the big screen. Following on from last week's challenge, for which I created a layout featuring several of my books, I thought I'd share some of my favourites with you. So, I've photographed some of my bookshelves, uploaded them to my Flickr gallery and added notes detailing some of the titles etc. You're welcome to go and have a look at them here. For a list of some of the the titles pictured above click here. I've copied this idea from Carl who used this method to share some of his photography books via Flickr. 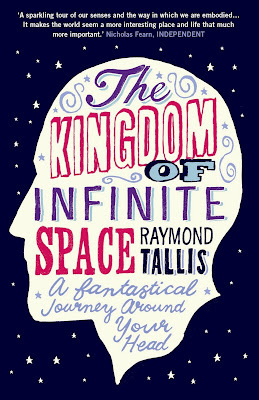 So, why not go and have a closer look at some of my bookshelves here + here then snigger, sneer and furrow your brow at my taste in literature or raise an eyebrow in recognition of some familiar titles. Either way.... after you've had a peek, if you'd like to leave me a comment here, or over on Flickr then I'd be happy [well, on second thoughts, maybe I won't be entirely ecstatic if you just want to let me know that you hate all the books I hold dear] ....then I'd be interested to hear what you've got to say! We'll be back with another challenge very soon ... in fact I've been dismantling some earrings this very day in preparation for it!